So… I was not anticipating being so touched by a movie about dams. How moving could that possibly be? Very moving, as it turns out. The people behind Stoecker Ecological, Felt Soul Media and Patagonia knew what they were doing when they made DamNation. If you haven’t seen it, set aside an evening very soon, get the movie on Netflix, pop some popcorn, and gather the kids around–yes, even the kids. The movie is that good. Hands down, salmon are the lifeblood of Northwest ecosystems. When salmon are free to do their thing–to swim from the upper reaches of our Western mountains out to the deep ocean (some reaching Japan), and then to come all the way back to start the next generations that will keep repeating the journey–they’re not just saving themselves, they’re helping us all. The one most important thing that we can do to set them free, free to provide this incredible, abundant resource for us and for the creatures with whom we share this planet, is to take down some dams that no longer serve our communities. And with well over 75,000 dams across America, there are a good number that fall into that category. Sounds radical? It’s already being done with great success and great results. It’s radically rational. Our National Park Service recently oversaw the biggest dam removal project in history. Beginning in 2011, the Park Service began removing the Elwha and Glines Canyon dams on the Elwa River in Washington’s Olympic National Park. These dams had shut off all but the lower five miles of river to spawning salmon. Now the waters flow freely from the Olympic Mountains headwaters all the way out to the ocean. Imagine all that rock and earth that the river slowly weathered away. It became trapped behind the dams for decades. As those building blocks of nature — the sand and dirt — tumbled past the remnants of the dams, acres of new beaches and estuary habitats were created seemingly overnight. And species came swimming, crawling, and slithering back. Their ancestors hadn’t been above these dams in more than ten generations. Yet in September 2014, three confirmed adult Chinook salmon were spotted above the site of the blasted-away dams. It was the first return of the Chinook in 102 years. Without the dams, salmon have come home. They’re getting 70 miles of their habitat back. Historically, when Chinook reached their full-size potential, they were 100 pounds or more–bigger than a German shepherd. The Elwha River dam removal shows us what is possible. But the removal of the four lower Snake dams is the Holy Grail. Removing these dams would mean we could restore the largest remaining potential salmon habitat in the lower 48 states. The Snake River dams are not just holding back a lot of sediment, they’re holding back salmon, orcas, and humans. They’re holding back the full glory of the Pacific Northwest. Imagine the richness of the ecosystems, the health of the oceans, the diversity of the species, the progress of the communities, and the return of the cultures that will all be revived in one fell swoop–or more accurately four fell swoops. Let’s make it happen. Want to make a difference? Go here and help us tell President Obama to take down those dams! 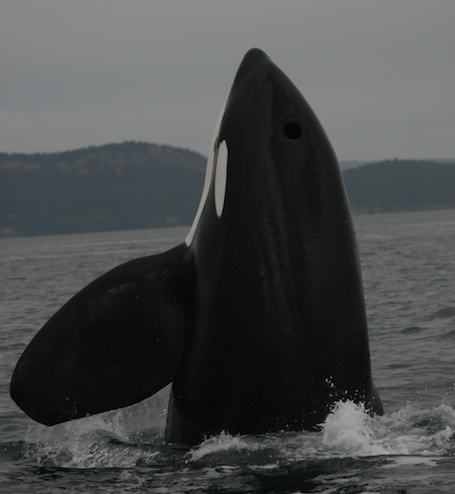 You can learn more from our member group, Southern Resident Killer Whale Chinook Salmon Initiative and Save Our Wild Salmon.